Inverted Microscopes have the light source and condenser above the stage, rather than beneath, while the objective lenses are found beneath the stage. On a compound high power upright microscope, the light source and condenser are beneath the stage, while the objective lenses are above the stage. The image below of the Motic AE2000 inverted microscope gives you an idea of where some key components are located on an inverted microscope. 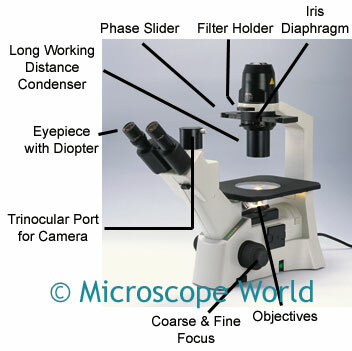 Definitions for each of these microscope parts are listed below. Objectives: The objectives provide magnification for viewing specimens. 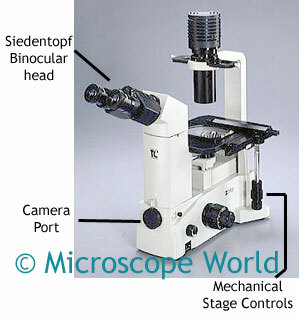 Total microscope magnification is a combination of the objective power and the eyepiece magnification. For example, if you are using a 10x objective and WF10x eyepieces, your total magnification is 100x. Coarse & Fine Focusing: Allows you to fine-tune focusing for a crisp, clear image when looking through the eyepieces. Trinocular Port for Camera: A port where either a digital SLR camera can be adapted, or a microscope camera, using a C-Mount Adapter. Eyepiece with Diopter: The eyepieces are used to view the microscopic image. The diopter allows correction of dioptric differences between both eyes. Long Working Distance Condenser: A condenser that has a longer working distance, allowing for larger specimens to be placed under the microscope. Working distance is the amount of space that must be between the specimen and the objective lens in order for the image to be in focus. Phase Slider: Used to view items with phase contrast objectives. Filter Holder: Filters (such as a daylight filter or a blue filter) are often used when capturing digital images to prevent hotspots, or to balance out colors for identification of different specimens. Iris Diaphragm: Part of the condenser that helps to focus light on the specimen, the iris diaphragm controls the diameter of the light that passes through the condenser. The main advantage of an inverted microscope is the ability to view live specimens in petri dishes (rather than squished between a glass microscope slide and cover slip). The petri dish provides the opportunity to keep specimens in their natural conditions, which can extend the life of the specimen and provide longer viewing opportunities. Additionally, rather than having a full phase contrast microscope, the phase slider can be used in place of staining. Staining can sometimes kill specimens, whereas phase contrast does not require the use of stains. This is the Meiji TC-5300 inverted microscope. Similar to the AE21 microscope shown above, this microscope has a full phase contrast setup. The binocular version has a camera port where either a digital SLR or C-Mount camera can be adapted. The trinocular version would allow two cameras to be attached at the same time. The mechanical stage allows movement of the stage from left to right or forward and backward with the turn of a knob. This is often helpful at higher magnifications when it is easy to move the specimen right out of the field of view if a mechanical stage is not being used.